President DR. C. H. Ohr, Mayor of city. Vice-Presidents J.W. Magruder, John Gephart, A; M. L. Bush. Secretaries-— A. J. Boose, Geo, T. Knorr. The Chairman stated the object of the meeting to be, to tender to the military authorities and their forces the thanks of the citizens for their noble and successful defence of the city during the past week from the plundering and devastation of Rebels who strove to effect an entrance. On motion, a committee of seven on resolutions was appointed, consisting of Messrs. George A. Pearre, Dr. S P. Smith, Geo. A Hoffman, Joseph M. Strong, C. W. Brengle, H. D. Wineow, and John Johnson. 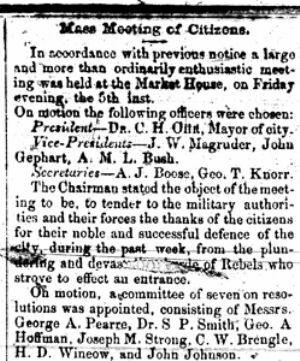 Resolved by the citizens of Cumberland, in Town meeting assembled, That We tender to Brigadier General B. F. Kelley, and the brave officers & soldiers under his command, our warmest thanks for the skill and energy displayed by the General and his officers and the bravery exhibited by the troops under their command, in their successful resistance to the capture of this city by the Rebel forces on Monday last. And we also tender our thanks to the gallant officers and soldiers engaged in resistance to the Rebel forces at Green Spring and New Creek; the former of whom, though consisting of but a small force, made their own terms of capitulation with Gen. Bradley T. Johnson's Division; and the latter of whom successfully drove back the Rebel forces from their attack upon New Creek. 2nd. Resolved, That in the opinion of this meeting we are indebted to the brave men who risked their lives in our defence and in defence of our town and property, for the avertion of a dreadful calamity, similar to that lately inflicted upon the people of Chambersburg, by the same men who applied the torch of the incendiary to that town, and turned houseless & homeless upon the world thousands of non-combatants with their wives and children. 3rd. Resolved, That it would be highly gratifying to the citizens of this town to have afforded them an opportunity to show to their brave defenders; by some public demonstration, their heartfelt gratitude for the obligations under which they rest for the preservation of the city: and to that end, that a committee be appointed by this meeting to wait upon General Kelley, and request him to afford them such opportunity as soon as the public safety will permit. 4th. Resolved, That a committee be appointed to deliver to General Kelley a copy of these resolutions, and request that the same be made known through him, officially, to the gallant officers and soldiers under his command. 5th. Resolved, That we also tender our heartfelt thanks to those of our brave citizens who volunteered so readily to aid in the defense of the city. 6th. Resolved, That the proceedings of this meeting be signed by the officers, and published in the several papers of this city. The committee called for in the resolutions consists of the following gentleman:—Messrs. Dr S.O. Smith, Gen. C. M. Thruston; Wm.. Wickard, John H. Kelenbeck, J. B. H. Campbell. Resolved, That all sympathizers with the rebellion, male and female, who expressed their sympathy during the late attack on our city, or who may hereafter express such sympathy, be sent by General Kelley to the so-called Southern Confederacy, where they legitimately belong. Col. Putnam, 152d Ohio Regiment, closed the meeting with a few pertinent remarks, eulogizing his own State and our 2d Maryland Regiment, and urging the citizens of Cumberland and the State of Maryland to perfect a Militia System, which would enable them to defend their own borders instead of depending altogether upon their neighbors.